Hello. Yesterday I noticed a story on CNN about students using i-Pods to cheat on tests in school and several schools have decided to ban i-Pods because of this situation. Clearly, cheating is not appropriate in any format but I think the greater story here is the fact that students are using this new technology and teachers should be adapting the delivery of content to take advantage of the popularity of MP3 players instead of banning them from schools. Regular listeners to this podcast know that I have used "StudyCasts" - audio reviews for upcoming tests that I post on our classroom web page and make available through iTunes - for the past two years and it has been a powerful study tool for my students. Parents have embraced it and other teachers have incorporated it into their curriculum. Other examples in our district include special education teachers recording the instructions for tests and help with reading assignments using MP3 players. Hello. It's been a while since my last podcast - lots of things happening as we finish out the school year (a student told me last week we had 28 days left in the year). I'm also trying to paint and remodel our basement which also serves as my office and "recording studio". I was interviewed last week by Steve Hargadon of Granite Bay, California (some of you may also know Steve as a contgributor to the Infinite Thinking Machine blog) for a podcast series he is doing entitled "Classroom 2.0". I had a great time visiting about the use of podcasting in education and he currently has the interview posted to his blog. Here is a direct link to the blog post and podcast interview with Steve. 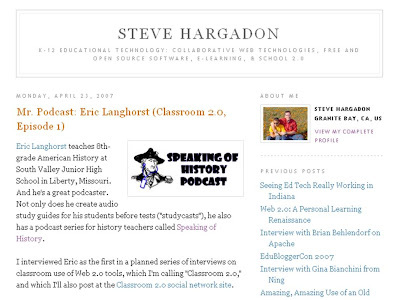 Thanks Steve and I look forward to future episodes on how other teachers are using Web 2.0 in their classrooms. Hello. I have recently been tyring out the new Teacher Tube and have found it to be a great resource for teachers who want to view and/or post educational video. Last night I produced a short (3:45 minutes) video that describes the Guerrilla Season Book Blog my students participated in this past fall. I posted it on Teacher Tube and will embed it with this post. It is created with Photo Story 3 - a slick application for making videos from digital still pictures. The narration was done in audacity and then included with the video. Here is a link to a higher quality version of the video - it will load slower. Hello. 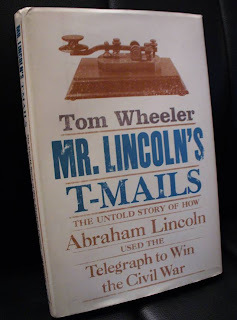 Today's podcast is an interview with author Tom Wheeler about his book "Mr. Lincoln's T-Mails - The Untold Story of How Abraham Lincoln Used the Telegraph to Win the Civil War". I read this book a couple of months ago and found it to be very fascinating. I had never viewed Lincoln as an early adopter of technology but the way he used the telegraph during the war was really bleeding edge in the 1860's. During the interview with Tom Wheeler we discuss researching the book, his favorite Lincoln telegrams, the importance of teaching history in our nation's classrooms and which famous figures from American history he would invite to dinner. A special thanks to Mr. Wheeler for taking time from his busy schedule to visit with me about his book. Please feel free to leave a comment to this blog post or e-mail me at speakingofhistory@gmail.com I would love to hear your thoughts and comments about the podcast.